Velaccio is a gold dressing table stool with a versatile soul and a stylish look. This small square pouf enhances the room in which it is placed, whether it is combined with a desk, a console or a coffee table. Gold low stool with metallic structure, Velaccio offers a padded blue leather pouffe. Use the upholstered pouf to sit at a table, desk or console, transforming it into a multipurpose piece. Velaccio is a high end leather bedroom stool with a golden metal structure and upholstered seat, covered in brown woven-effect leather. Glamorous, practical and multifunctional, allows for seating. 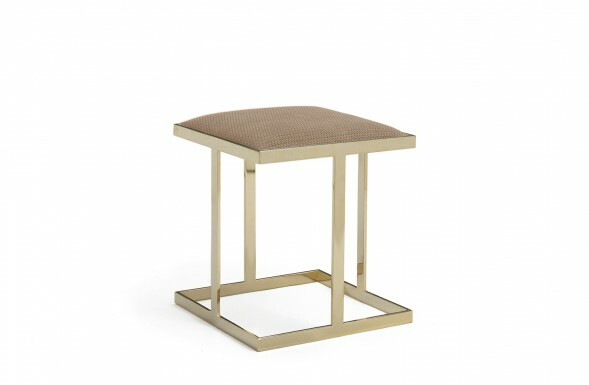 Velaccio is a refined gold and leather low stool with a polished metal frame. Perfect complement for a luxury living room, it combines with sofas and armchairs and can be used as a side table or footrest. Velaccio is an elegant small stool with leather seat and a square shiny golden structure. A versatile addition to any living room, this pouffe can be used as an extra seating, side table, footrest. Velaccio is a metal and leather pouf that features a rigid metal structure with a bright gold glossy finish. Fine materials and accurate finishes define a luxury complement made to furnish classy houses. 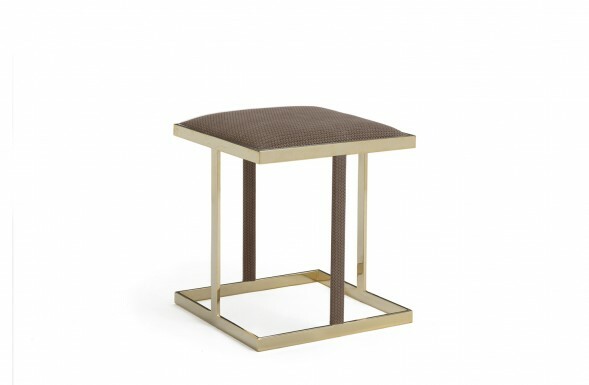 Gold vanity table stool, Velaccio is a luxury complement usable as a side table, pouffe, footrest, extra seating for guests. The sturdy structure in golden metal makes for many uses. The square metal base ottoman Velaccio offers a high end complement. The metallic structure has a gorgeous polished golden finish and is topped by a padded seat, upholstered in beige leather.